Synopsis: Katniss Everdeen (Jennifer Lawrence) and Peeta Mellark (Josh Hutcherson) become targets of the Capitol after their victory in the 74th Hunger Games sparks a rebellion in the Districts of Panem. Review: Being the middle installment of any book or movie franchise poses a unique problem – there’s no start and end to the story, and many audience members will leave the cinema feeling dissatisfied at the lack of a denouement. This is the case for Catching Fire, the follow up to last year’s box office blockbuster The Hunger Games (although now that they are splitting up Mockingjay into two films, Catching Fire doesn’t exactly sit right in the middle any more), but it’s very interesting to see where the film has brought the franchise to. It’s a much darker, broodier movie, and sets the tone for the even bleaker events unfolding in Mockingjay. Armed with a much larger budget ($130 million versus the first film’s $78 million) and a new director who cut his teeth on music videos before moving to film, it’s almost a given that Catching Fire will be the handsomer movie. Coupled with impressive performances all round, particularly that of Jennifer Lawrence’s, and the compelling screenplay, it’s readily apparent that as the title suggests, the box office for the film would be quite fiery indeed. Catching Fire belongs to a rare breed of page-to-screen movies which would please both fans and non-fans alike. 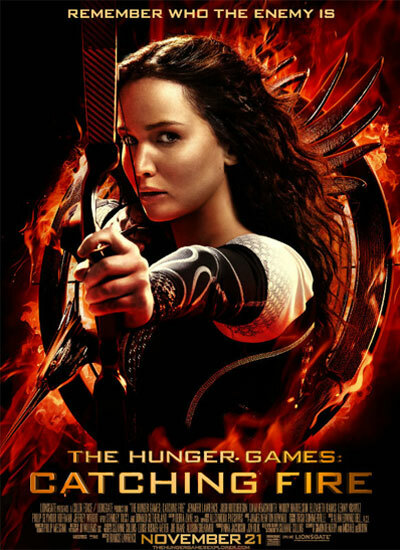 A caveat – it is essential to have prior knowledge of The Hunger Games (whether in novel form or from the first movie) because Catching Fire jumps right into the narrative without any preamble. Anyone not initiated in any way before watching the movie would certainly find it hard to navigate around the multi-layered plot (masterfully put together by lauded scribes Simon Beaufoy and Michael Arndt) and figure out exactly what is going on. This is not a film that will be coherent on its own. However, anyone who is already familiar with the Hunger Games backstory would find that Catching Fire has managed to elevate the franchise to way beyond a mere film catered for young adults (yes, Twilight, I’m looking at you). Yes, there’s a pseudo love triangle, and yes there are the occasional moments that lapse into pouty teen movie territory, but thankfully these are few and far between. Catching Fire is a somber movie dealing with rather adult themes, and even the Hunger Games itself is a more joyless event this time round – it’s clear that no matter who survives the Games, the victory will be a pyrrhic one. The film also concludes on a grim note, almost identical to how the Catching Fire novel ended. Jennifer Lawrence reprises her role as Katniss Everdeen, and once again proves that she is definitely one of the best young actresses of our time. Katniss has been emotionally damaged after the conclusion of the first Hunger Games, and Jennifer Lawrence manages to flesh the character out further along this line. She manages to craft a tangible, strongly identifiable character out of Katniss, and commands the full attention of the audience whenever she appears. The rest of the ensemble cast are very capable as well, particularly Woody Harrelson and Donald Sutherland, who both shine in the small number of scenes they have. The male heartthrobs Josh Hutcherson and Liam Hemsworth are the weakest links in the movie, but that may have been a construct of the script rather than due to a lack of thespian skills. Costume design and art direction is superlative in Catching Fire – the costumes in particular are stunning, well worthy of many nominations (and potentially, wins) in the upcoming awards season. The increased budget also shows in the set design and effects, especially during the Quarter Quell itself. Catching Fire is a complete package, even though the storyline isn’t – it boasts everything that the original Hunger Games has, and ups the ante in almost every way possible. The film has set the tone for the franchise, and it is now with great anticipation that I await the next two films in 2014 and 2015 to conclude the franchise.